Common problems with existing air conditioners result from faulty installation, poor service procedures, and inadequate maintenance. Improper installation of your unit can result in leaky ducts and low airflow. Many times, the refrigerant charge (the amount of refrigerant in the system) does not meet manufacturers’ specifications. If proper refrigerant charging is not performed during installation, the performance and efficiency of the unit is impaired. Service technicians often fail to find refrigerant charging problems or even worsen existing problems by adding to a system that is already full. If you suspect that your air conditioner wasn’t installed correctly, or you’re experiencing any other air conditioning issues, please contact our HVAC contractors today. 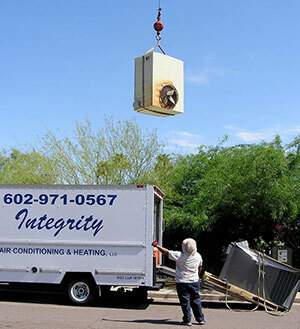 Integrity Air Conditioning And Heating brings nearly three decades of experience to the table, offering you outstanding HVAC service in the greater Phoenix region. Our experts offer HVAC replacement, repairs, and more. Contact us today at 602-971-0567 to get started. HVAC systems are complicated, and to add to the complexity, there are numerous makes and models to choose from. Qualified HVAC contractors need to know how to service, maintain, and repair all types of heating and cooling systems found here in the greater Phoenix area. At Integrity, we’re up to that challenge! In fact, we can assist with problem-solving of your residential or commercial equipment in numerous scenarios, including when your air conditioning system isn’t providing adequate cooling, when your furnace is making loud noises whenever it’s running, when you detect too-cold or too-hot spots in certain regions, or when your utility bills are way too high. For problem-solving expertise and the solutions you need, contact the HVAC contractors you can trust. Contact Integrity today!